Cyclesnack: Three miles are better than none! I was kind of hoping that Brown Santa would be dropping off my Edge705 in time for this ride but it didn't happen. 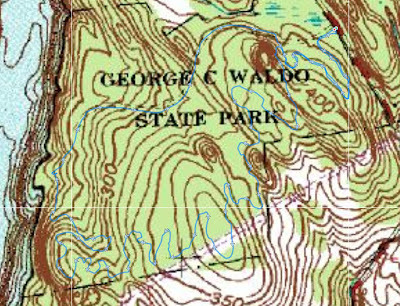 I headed over to George C Waldo SP to ride the Where's Waldo Trail for a number of reasons: I am burnt out riding my Upper Gussy Trail and my guess was that the conditions were going to be abysmal. I figured Waldo would be in fine shape because it usually can take a deluge of rain and be rideable the next day. I was about 90% accurate. There was, unfortunately one section that was too soft to be riding on. Looks like I might have to go back and help the trail boss armor that one section. I did, however, find a nice skinny to ride, though. I only had enough time and light for one run down the Waldo and then back up on the fire road. The fire road was horrible, very soft, and muddy at times to which I actually got off the bike and walked a few times, in the flats, too. I like to try and work in a quasi figure 8 that incorporates taking the Hunters Trail each way and hitting each section (bisected by the Hunter's Trail) to get the up and down effect and thus more miles. Today it was only three but riding for an hour is better than not riding at all. I did try lowering the seatpost so that I could get back behind the seat when descending steep slopes or rollers but I found I went too far and had to stop to raise it a little bit. Otherwise, riding the 'Horse keeps getting better and better. The Waldo trail goes through quite a few stone walls and has some nice technical areas and the full suspension just floats through it all! This trail is purley XC with a few up-and-overs, one in which I built two years ago on one of the trail work days and few others but there are no rollers or hucks. Yeh that first section definitely looks soft, but the last photo looks like an awesome corner! Good stuff.